Sip with pride, Tiger pride! Class, style, and just plain fun way to show your true colors and keep your beverage cool at the same time. 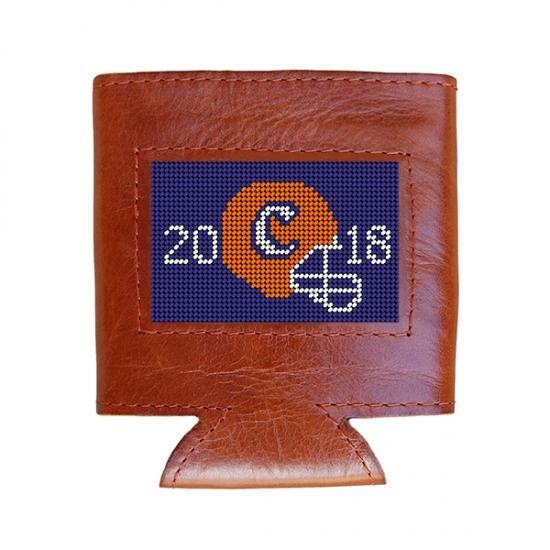 Detailed design featuring the classic Clemson orange and white on a proud purple background. Full-grain Italian leather seasons with age, becoming more supple and beautiful over time. The neoprene lining keeps your drink cool and your hands dry for many tailgate toasts. Enjoy! Don't forget to order your Clemson National ChampionshipBeltandKey Fobas well! Price: $30.00 In stock! - Browse this brand: Smathers and BransonOur products are custom made to your specifications. This product ships up to 2 weeks after your order is placed.